As the web evolves, so does the way people interact with the web. Firefox’s user experience and research teams have been eager to learn about our users’ browsing habits so that we can better design for our users. 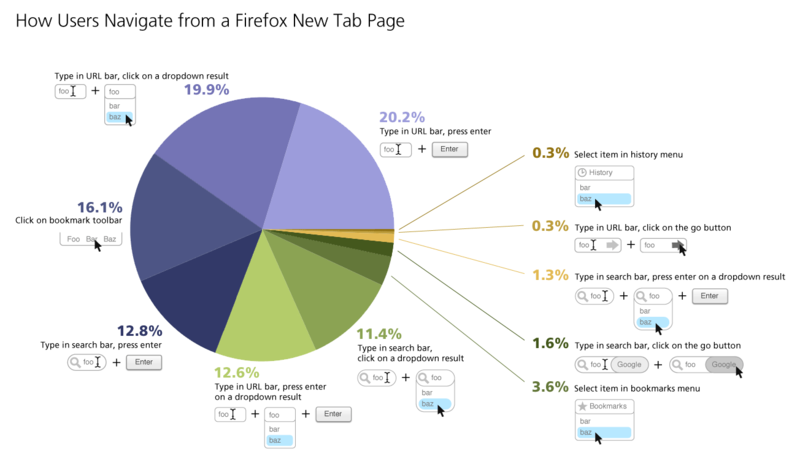 Lately, Mozillians like Lilian Weng and Jono X have been running some fascinating studies using Test Pilot to determine how, when, and why Firefox users open new tabs. I wanted to note a few key takeaways from their recent study that give us a glimpse into how our users browse (full studies are linked at the bottom of this post). A caveat is that these results – as with all Test Pilot studies – are gathered using anonymized data submitted by users who have signed up to participate in Test Pilot. Thus, the Test Pilot users data tends to skew slightly towards the technical and early-adopter crowd. How are people currently using new tabs? Each day, the average Firefox user creates 11 new tabs, loads 7 pages from a new tab, and visits 2 unique domains from a new tab. The average new tab loads two pages before the user closes or leaves it. Once users have a new tab page open, about half of the time (53%) they navigate to a new page using their mouse, and about half of the time (47%) they use the keyboard. 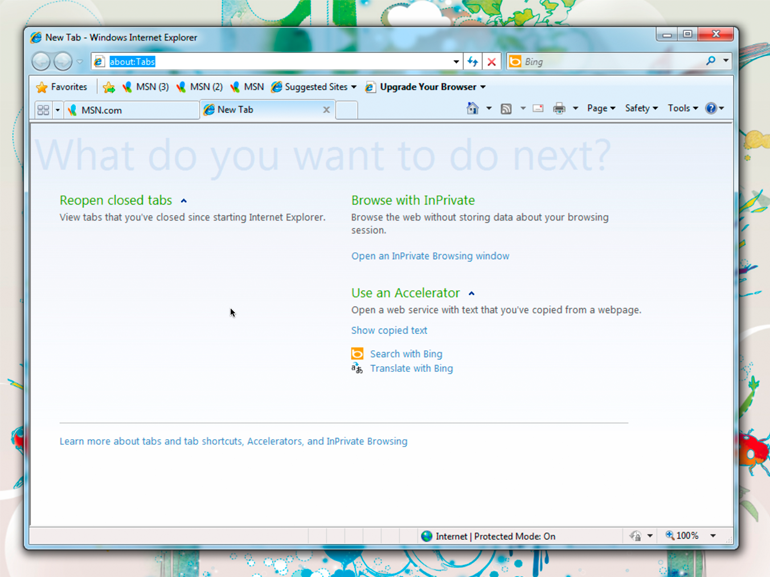 As you can see above, the URL bar was the most-used item on a new tab page, with 53% of use actions originating there. The search bar only accounted for 27% of user actions. Even though by default it’s not even enabled in Firefox, 16% of new tab page actions were clicking on a URL in the bookmark bar. History and bookmarks menus were both used less than 5% of the time. In this study, 17.4% of the domains recorded accounted for 80% of the page views for all participants. You might think that the more active a user is, the number of unique domains they’d visit would follow the same ratio. However, this study found that the more sites a user visited online, they more often they would visit the same 20% of domains. Turns out, the most active internet users are even more loyal to a few choice domains than their less active counterparts. 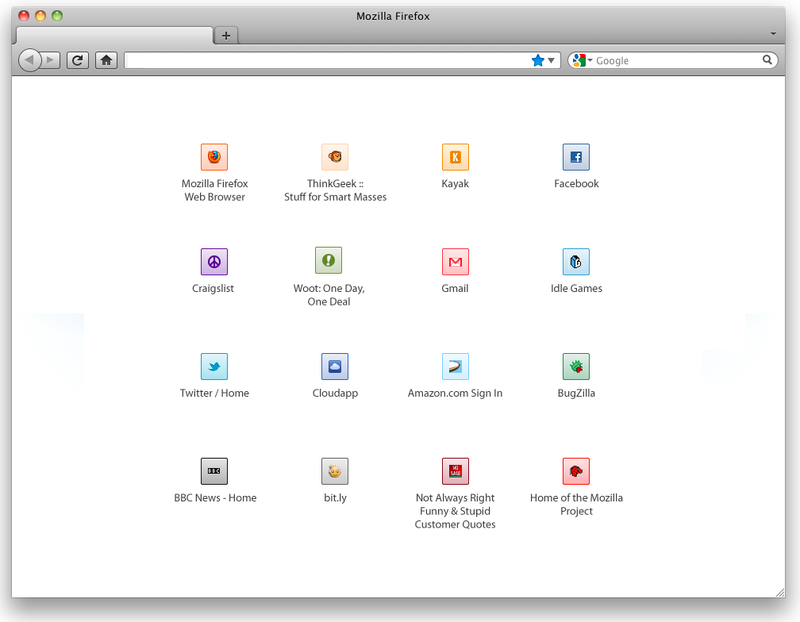 The Mozilla user experience team often designs features that represent sites to users in a variety of ways. For example, Firefox tabs display favicons and page titles, while Panorama displays favicons, titles, and page thumbnails. So, I thought it would be useful to investigate the effectiveness of various ways of representing sites to users. 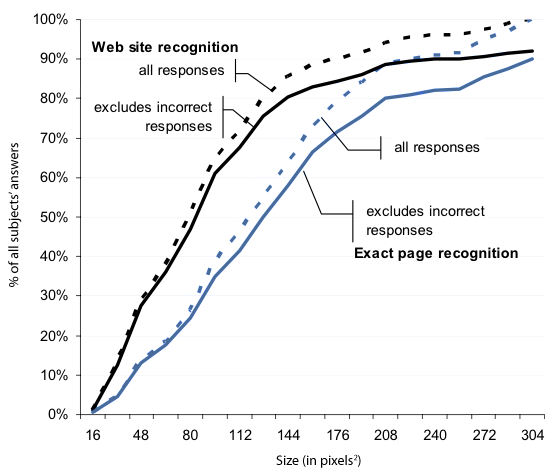 One interesting piece of research on page representation was published by Shaun Kaasten, Saul Greenberg, and Christopher Edwards at the University of Calgary in their paper How People Recognize Previously Seen Web Pages from Titles, URLs and Thumbnails (download it here). This team conducted a series of studies, most of which involved increasing one variable which represented a site the user had previously visited (such as thumbnail size) until the user recognized it, at which point the user would buzz in to stop the expansion and identify the site. – The graph above plots the thumbnail sizes at which test participants could recognize a domain (black lines) and a specific page within a domain (blue lines). The dotted lines show all responses, and the solid lines show only correct responses. You can see that by the time a thumbnail was 962 pixels, 60% of test subjects had identified it. 80% of test subjects identified sites by 1442 pixels, and by 3042 pixels everyone had identified the site. 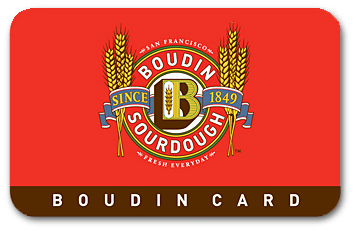 – Users’ guesses about what site a thumbnail was representing were correct about 90% of the time. Not bad, considering on most sites they had no readable text to go by until the thumbnail was over 962 pixels. This shows how effective thumbnails are at identifying sites to users. – Color and layout in were the most important factors for identifying a site when the thumbnail was 642 pixels and smaller. 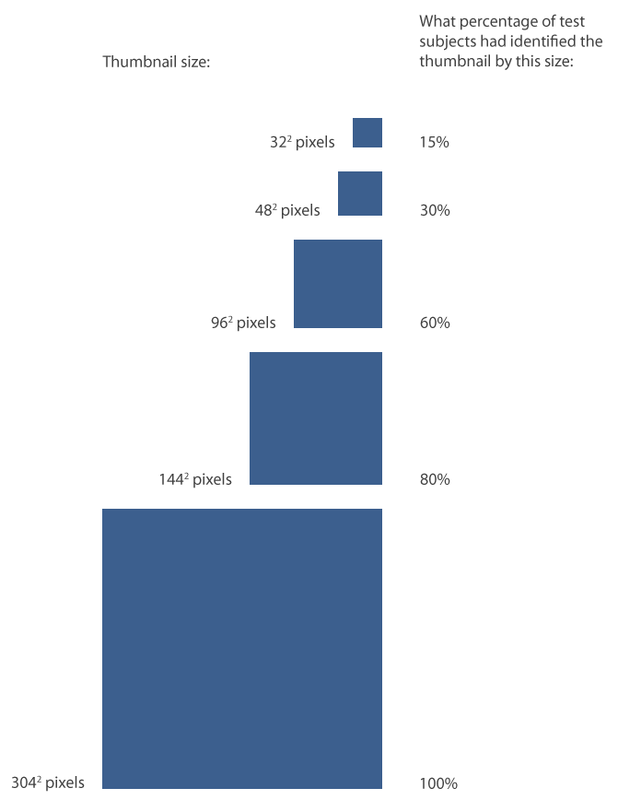 From 642 to 962 pixels, color, layout, images, and text were equally important. Above 1002 pixels, text was most important. This is presumably because at that size, sites were not yet identified because they were visually similar to other sites and text was the only effective differentiator. – Looking at only truncated URLs and page titles, test subjects could correctly identify sites 90% of the time. The researchers experimented with URL and title representation by showing users right, middle, and left truncated strings and recording when they buzzed in to identify the site correctly. – The graph above shows the running sum of correct answers in identifying sites based on only page title (top graph) and URL (bottom graph). You can see that right truncation proved the most effective for domain-level site identification. For titles and URLS that were truncated on the right, sites were correctly identified 15% of the time with 5-6 characters revealed, 30% of the time with 8 characters, 60% of the time with 13-15 characters, and 80% of the time with 25-31 characters. Left truncation was the most effective for identifying a specific site within a domain. So, if you want users to identify a site based on a string, at least 15ish characters are needed for even a majority. If you want users to identify a subdomain, clip right left side of the URL. 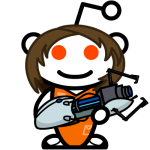 To idenfiy the domain itself, clip the right. 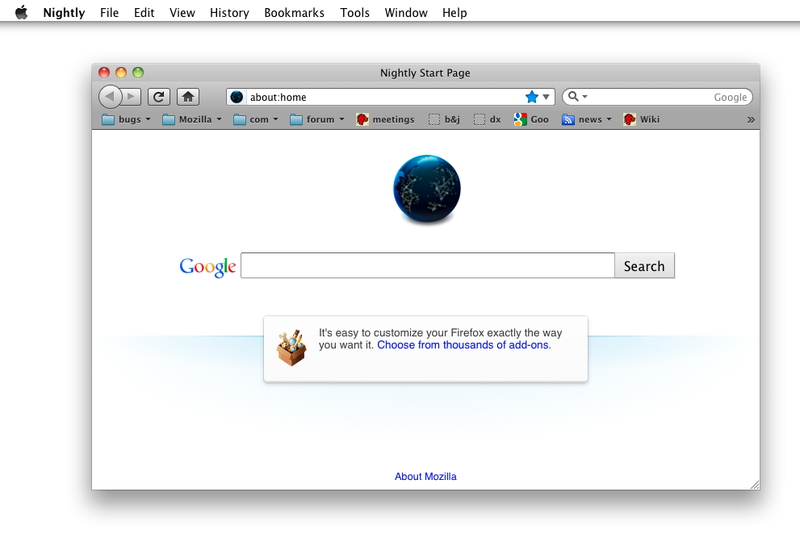 I’d like to highlight the awesome research project that intern Lilian Weng is leading around Firefox’s new tab page. While our goal is to make users more efficient at their browsing tasks, what makes them more efficient is a question we keep returning to. 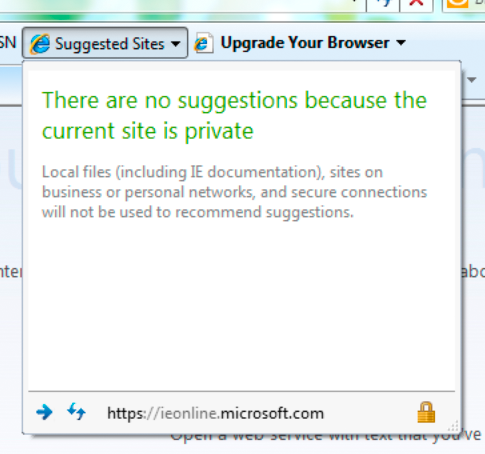 Most other browsers display links on new tab pages based on frecency. Frecency is a portmanteau which combines frequency and recency. 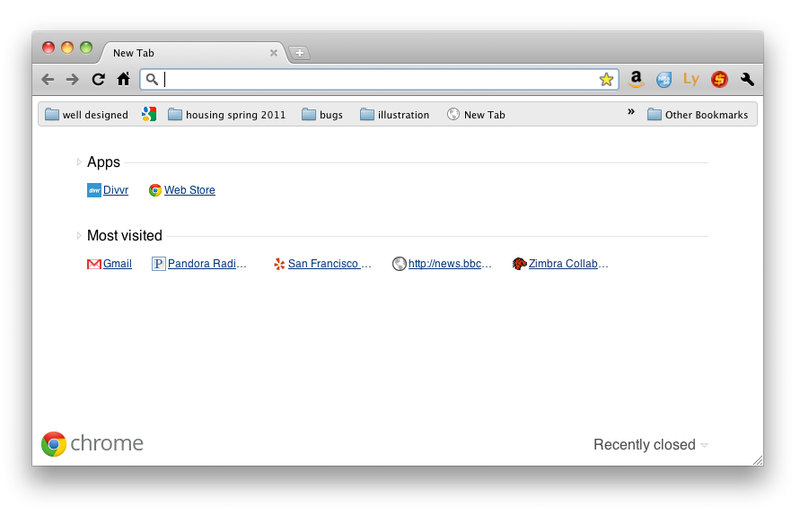 At Mozilla, we use it to refer to sites that users have been to often, recently, or both. It’s how we calculate what should be the first, second, third, etc site that appears when you type a letter into Firefox’s URL bar. Frecency. A combination of a user’s most frequently and most recently visited sites. Most recently bookmarked sites. By displaying prominently what a user has recently starred, we effectively turn the new tab page into a read it later list. Most recently closed sites. This could lead users to treat new tab page as an undo feature, or close tabs in order to temporarily store them in the new tab page as a short-term read it later list. Sites based on content similarity. Intern Abhinav Sharma is trying out his project, called Predictive Newtabs, which displays sites based on where the user has opened a new tab from. For instance, if the user has been browsing a news site, a new tab would offer other news sites the user has been to. Sites based on groups of sites frequently visited together. In another part of Abhinav’s Predictive Newtabs experiments, he has designed an algorithm to predict sites to show based on sites users visit in groups. For instance, if every time you get to work you first check the weather and then check stock prices, this new tab would offer you a stock page on a new tab after you checked the weather. If you want to try this experiment out yourself, you can download the Jetpack here. The above study is still in preparation, and once it goes live I predict that we’ll learn tons of valuable information about how new tab suggestions can positively impact users. Lilian will be collecting data on many aspects of users’ responses to these designs, such as how they effect the breadth of sites users visit, how likely they are to click on each item in the grid, and how long they spend deciding where to navigate. I can’t wait to start pouring over the data that comes back: it’s very new research in an area that has a profound impact on how we use the web. I find Joe, a 60-year-old hospital cafeteria employee, in the food court looking suitably bored out of his mind. Joe agrees to do a user test, so I begin by asking my standard demographics questions about his experience with the internet. Joe tells me he’s never used a computer, and my eyes light up. It’s very rare in San Francisco to meet a person who’s not used a computer even once, but such people are amazingly useful. It’s a unique opportunity to see what someone who hasn’t been biased by any prior usage reacts. I ask Joe if I could interview him more extensively, and he agrees.